¡Hola! My name is Mary and I will be your host on this extraordinary adventure. We will be flying for eight hours from the United States to one of the most historic countries in South America: Peru. With our imagination, we will be departing from the Philadelphia International Airport—of course, we will need to follow all the US Customs Service regulations to travel overseas—to the city of Lima. In the airport, the officer in charge will make sure that our passports follow all the guidelines for traveling abroad. After leaving our suitcases at the airline, we will be waiting for our airplane that will take us above the blue sky crossing over not only the big North Atlantic Ocean but also the high mountains of the Andes. After flying 3,600 thousand miles and flying over countries such as Mexico, Panama and Colombia—just to mention a few of them—we will be arriving in the capital of Peru, Lima. In the city of Lima, we will only be staying for a few hours until we can embark on our flight to Cusco, our final destination. During this time, at the Aeropuerto Internacional Jorge Chávez, we will need to convert our bolsa de viaje from dollars to Nuevo Sol (Peruvian currency) and buy a few cloth items, such as a raincoat and a warm chullo hat that can helps us be prepared for the changing weather conditions in Cusco—we can experience a heavy rain, hot summer, and cold winter seasons in just one day. That’s why we need to be prepared for that climate change! Also, we will need to drink a lot of mate de coca that can help us prepare our body for the high altitudes of the Andes—can you imagine the fresh breeze touching your skin and your body breathing pure oxygen with no pollution? After arriving in the city of Cusco, and going to our hotel and resting for a little while, we will be traveling by train for three hours and thirty minutes to the town of Aguas Calientes, viewing the amazing and dense green landscape of the area, the beautiful dark brown mountains, and listening to the turbulent sound of the Urubamba River—maybe, if we are lucky, we can see el condor flying above the blue sky with his wide black winds. Do you know that this Andean Condor has a natural feather white collar in his neck? In the train station of Machu Picchu, we will take a bus for about thirty minutes, and walk for another thirty minutes to the Historic Sanctuary of Machu Picchu (UNESCO World Heritage Site), where I will be reading bilingual Peruvian Spanish/English stories about the lifestyle of the cusqueños and the typical animals such as la llama and el condor. Maybe, in la Cuidad de los Incas, we will be learning a few Quechua and Spanish words that can help us buy and taste the quinoa soup or other typical dishes that are made with the grains of this area, in the mercado of Cusco. ¡Acompañame, te invito a esta fascinante aventura bicultural! Where is the country of Peru located? Peru is located in South America. Ecuador, Bolivia, Colombia, Brazil and Chile are Peru’s neighboring countries. Cusco is located in the Central and Southeast area of Peru. The ruins of Machu Picchu lie on a high ridge, surrounded on three sides by the windy, turbulent Urubamba River some 2,000 feet (610 meters) below. Is Quechua one of the indigenous languages spoken in Cusco? Yes, Quechua is the language of the Inca Empire and one of the aboriginal languages spoken in this area; the other one is the Aymara language. The Lama (translated in Spanish as la llama) is a domesticated South American camelid used as pack animal by Andean cultures and Pre-Columbian era. The Condor (translated in Spanish as el condor) is a large black vulture with a ruff of white feathers surrounding the base neck. The Incas considered the condor as the most sacred birds. 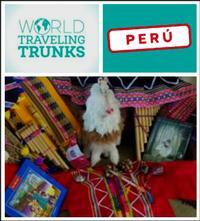 Where can we see the Peruvian Traveling Trunks? Children’s Day/Book Day at Andorra Library on Monday, April 8, 4:15 p.m. Immigrant Heritage Month at Queen Memorial Library on Friday, June 7, 11:00 a.m.
Save travels!! ¡Nos vemos pronto! Add a Comment to The World Traveling Trunk viaja a Sudamérica: ¡Bienvenido a Perú!